Photo illustration by Jim Festante/Slate. Photo by iStockphoto. Reminder: Matt Yglesias and Farhad Manjoo are wargaming a fanciful, definitely-not-actually-true version of what might happen if Google and Apple went to war. You can see how the battle began here. Territory controlled: Offices, retail stores, factories, and the political allegiances of China, Europe, the Middle East, and a growing number of Americans. There’s a grim mood in the hastily assembled Cupertino, Calif., bunker where Apple’s executives have hunkered down. But the phone is ringing off the hook. Google’s tactics, though devastatingly effective, are also terrifying to many citizens. While click-dependent digital media may buckle under to Google’s demands, television remains Americans’ main source of news and the offline coverage of Google’s offensive is devastating. The New York Times is able to get by on traffic from iOS devices (mobile is the future, after all), and a solid minority of American digital media sticks with Apple, hoping for a larger share of a smaller pie. Meanwhile, a European Union already worried about Google’s monopoly power and concerned about surveillance moves decisively into backlash mode, barring the company from doing business in Europe and seizing its fixed assets there. And while it’s true that Google has many offerings Apple can’t beat, it’s also true that Germany entered World War I with the strongest overall military. War is a game of coalitions. Not only are there whole countries where Google barely exists (think China), but there’s a whole world of online services companies out there who’ve been chomping at the bit for a big Google scandal to get them into the game. Bing search, Outlook webmail, Yahoo Calendar, and Dropbox for storage. Google’s one-stop shopping is a convenience, but people in Google-hostile territory can use the Web without it and the company’s behavior is frightening people. Apple’s hearty band of loyalists can shop at the Apple Store and punch apple.com into the browser just fine—and while they’re there, many of them are adding their contact information to a new page which urges Apple fans to join the “Apple Army.” The photo accompanying sign-up shows a cheerful, attractive, multicultural group massed in front of Apple headquarters, everyone wearing T-shirts of bright, primary colors. In the first week, 20,000 Apple partisans sign up. And Google has forgotten the fundamental reality that the Internet is a physical entity. Customers are a little surprised to find every Apple Store in the Portland area closed at lunchtime, but it’s just a quick 90-minute jaunt down I-84 to Google’s data center at The Dalles, Ore., one of six within the United States. 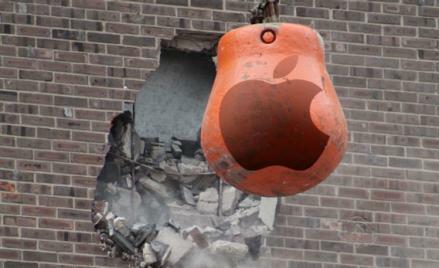 Tim Cook never really thought it would come to this, but as Apple’s longtime logistics guy he’s always made sure the company can get its hands on demolition and construction materials at a moment’s notice. And what can be used to renovate a store can be used to wreck a data center just about as easily. No government officials or law enforcement personnel will explicitly take Google on, of course, but everyone knows that if the data centers are destroyed so is the possibility for blackmail so it’s strictly hands-off. Meanwhile, other wrecking crews are already in motion heading out of Greensboro, Omaha, Atlanta, Charlotte, and Tulsa to attack the other data centers.